Graf Bolero women figure ice skates - The new Bolero ice skates for ladies is made of a synthetic leather and has a perfect fit with a good lateral support. 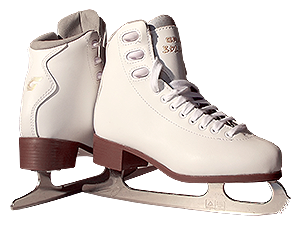 These skates have a shaft that is made of synthetic leather and is reinforced. The Artistic Skates are comfortably padded and have a special breathable lining. Do you have problems with the correct selection of shoe size? Send us an e-mail, we will help you! The skates are shipped uncut.